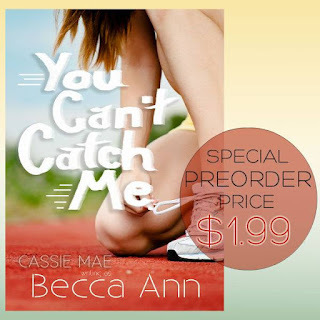 Today, we have a cover reveal from the awesome Cassie Mae for her new clean YA, YOU CAN'T CATCH ME! One of the things I always enjoy about Cassie's writing is how well she writes people's perceptions of their own bodies. It feels real and relatable, and usually really, painfully funny. I have a feeling this will be no exception. YOU CAN'T CATCH ME releases March 28, 2016. You can preorder YOU CAN'T CATCH ME now at a discounted price! And you can find more of Cassie's books here.